The month of April has lots of holidays. There's the Thai New Year that lasts one week and another holiday I can't seem to remember. I am thankful I can get to relax for a few days but having days off work is annoying because I have to double the amount of cakes I make to make up for the days I'm not working. Last week, I made 10 cakes in one day. I made the same amount 2 days after that. At the end of the week, I felt like my body reached its limit. Usually, on my way home, I plan on what to cook for dinner. But on that day, I was so exhausted I didn't even bother to think of what to eat. Once home, I couldn't ignore the urge inside me to prepare something for dinner.I checked the cabinet and my eyes laid on a bag of pasta I just bought. So I made this pasta dish with the last bit of energy I had. 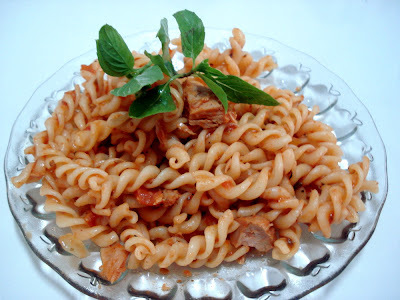 For me, pasta is one of the easiest dish to make. I like it because not much preparation is required to do it. I placed the pasta in a saucepan. I added oil and salt, and boiled it for seven minutes. I transfered the pasta in a colander. I placed it under a running water to remove its greasiness and drained. For the sauce, I used the leftover Garlic Salsa sauce from days ago. The label says use within 2 weeks after opening. We don't have nachos in stock anymore. I might as well use it before it gets bad. I poured the salsa into a sauce pan, added mixed Italian herbs, freshly ground black pepper and a bit of salt to taste. I added tuna right before I removed if from heat so it would retain its shape and flavor. I mixed the sauce with the pasta and served it with fresh basil leaf. We had a wonderful dinner.